Of course the desktop is useless unless you run programs on it. Programs run in objects called windows so let’s look at the components of a window. 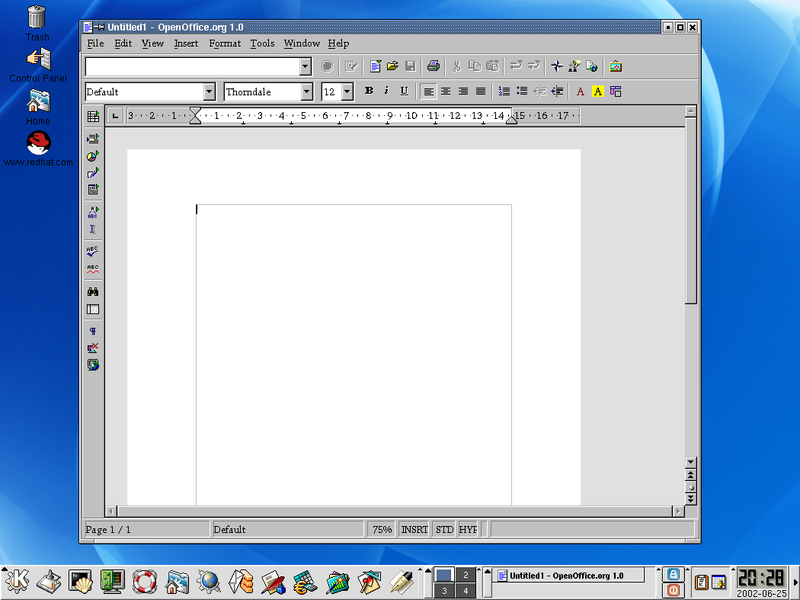 Figure 1 shows the KDE desktop with an application open – in this case the Open Office word processing program. Figure 1: An open window in KDE. This window is for OpenOffice 1.0, but it has all of the same basic components as all windows. All windows have many of the same components and we will discuss those that are common to all. The Open Office window shown in Figure 1 has all of those common elements plus many elements of its own. The simple window shown in Figure 2, below, also has all of the common elements you will find in windows. Let’s look at each of these components in some detail. The Title Bar is the bar at the top of the window. It contains the name of the application and perhaps the title of the document the application has open and active. This title bar from OpenOffice has the name and version of OpenOffice, and it has the name Untitled1 which means that this is a new document that has not been saved and given a name yet. Figure 2: A simple window with its component parts labeled. The Title Bar actually has another function besides just looking pretty and showing the name of the application in the window. If you double click on the Title Bar, the window rolls up like a window shade until only the title bar itself is showing. This is a good way to clear up some space on the desktop, and it would look very much like Figure 10, a Title Bar with no window under it. The Title Bar also allows you to move the window around on the desktop and place it in a location that is most convenient for you. Simply place the mouse pointer on the colored part of the Title Bar – that is any place that is not a button – and left-click and hold while dragging the mouse to position the window in your desired location. Figure 3: The title bar allows you to manipulate the window. Moving windows around on the desktop allows you to position them so that they are located most conveniently for your use. Figure 4: A Menu Button Icon. On the far left side of the Title Bar is the Menu Icon. Clicking on this icon opens the Operations Menu that provides you with several options. The menu icon is different for many applications and is usually a very small version of the desktop icon for that application. Like OpenOffice as shown in Figure 1, the Menu Icon is a tiny OpenOffice document icon. The window Operations Menu can also be opened by right clicking anywhere on the Title Bar or by right clicking on the button for the desired window in the Taskbar which is located on the KDE Panel. Most of these options like Minimize, Maximize, and so on are also available with other buttons that are part of the window. There are, however a couple menu items here that should be of interest. Figure 5: The Operations Menu is displayed when the Menu Button is clicked provides several user configuration and action options. 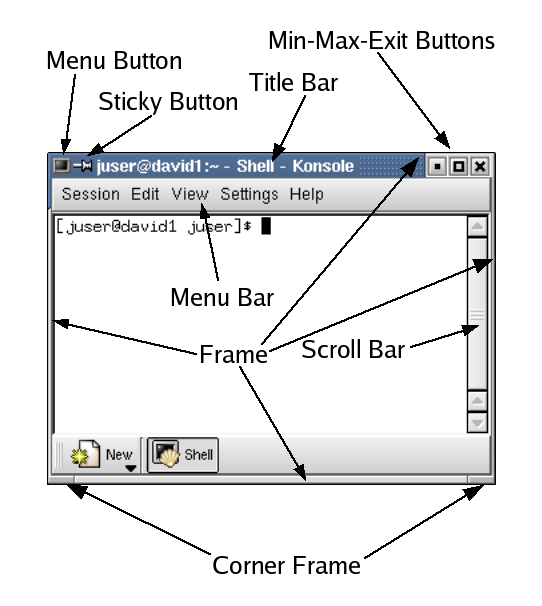 Most of these actions, except for those in the Advanced menu can be accomplished using the various parts of the window and its frame. Although there are equivalent buttons on the right side of the Title Bar, there are menu options here as well to allow you to minimize, maximize, shade and close the window. Almost all of the actions available in Title Bar Menu can be accomplished using the components of the window and its frame. Only the Advanced menu provides access to any functionality not more readily available through direct manipulation of the window. The Advanced menu option allows you to determine whether this window will be kept on top of or underneath other windows. It also allows you to set the key combination to use as the shortcut to the window, and to remove the border from the window. You can also access the Advanced menu by right clicking on the window’s button in the Task Bar which is one component of the KDE Panel at the bottom of the screen. In fact, the only time you will need most any of the menu options available via the Menu Button is when you remove the window border. It is the border which allows you to easily resize the window so, if it is no longer available, you can choose this menu to allow you to resize a window without a border. Some windows cannot be resized under any conditions, so this option is only good on windows that normally have a border to allow them to be resized. I very seldom use the Menu Button because, for the most part, it duplicates functions that are available more directly. In fact, I sometimes use window decorations – which you will learn to change shortly – that do not even have a menu button. If you actually need the window Menu, you can right click on the title bar to access it. The Sticky Button is the button that looks like a push pin that you might use for sticking notes or papers to a cork board. It is used to “stick” a window so that it appears on all of the Desktops. By default there are four desktops configured in KDE, and the default desktop is number 1. You can switch between desktops and have different programs on each desktop. This can enable you to organize your work by keeping programs related to specific projects on different desktops and switch between projects easily. Clicking on the Sticky Button so that it looks like it is sticking into the window, keeps the window on all desktops. This is handy for programs that you need access to regardless of the desktop in which you are currently working. In the position that the stick pin is shown in Figure 10, the window will remain on the desktop in which it was launched. It is important to realize that the Sticky Button does not appear in all of the different sets of window decorations. I will show you how to change your window decorations in a later section of this chapter but if there is no Sticky Button, you can perform the same function by using the window Menu button: Menu => Desktops => All Desktops. Or you can choose a specific desktop in which the program should reside. I will discuss multiple desktops more in a later section of this chapter. The three buttons shown in Figure 6 provide a fast way to minimize (the small solid square), maximize (the larger open square), and close (the X) a window. Just click on the desired icon to perform the action you want. Figure 6: The Minimize, Maximize and Close buttons – in that order. Minimizing windows allows you to clean up your desktop a bit. If you – like I do – tend to open a lot of programs and leave them open, the desktop can become cluttered by the large number of windows required for those programs. By minimizing the windows you don’t need for the moment, you can clean up your workspace on the desktop and make it easier to find the windows you do want. A maximized window is expanded to fill the entire desktop, with the exception of the KDE Panel. This provides you with the most screen real estate for the application which can mean the difference between seeing the entire window all at once and having to scroll to see the entire window, but only seeing parts of it at any one time. Of course with word processing documents and some other types of applications you may have to scroll anyway, but a maximized window shows you the largest area possible of a document. After a window is maximized, the Maximize button changes to show two overlapping squares rather than a single square; this is the Restore button. If you click on the Restore button, the window is restored to its original size and location on the desktop. And of course the Close button, which appears as an X, allows you close the window. As its name implies this closes the application in the window. Figure 7: Grab the frame anywhere around the perimeter of the window to manipulate the size of the window. The window frame is the small bar that runs around the four edges of the window. The frame provides a handle, as it were, to manipulate the size of the window. You may want to size a window in order to make it better fit the work you are doing or to provide space for multiple windows to fit next to each other on the desktop, or for any of your own reasons. Sizing windows is easy and enables you to make more efficient use of your workspace. To size a window, that is to make it larger or smaller, move the cursor arrow over the frame until it changes from a single headed arrow into a double headed arrow. Then you can click and hold the left mouse button and drag the window frame to make it larger or smaller. If you grab the bottom or top frame, the double headed cursor arrow points up and down and the window can be sized vertically. If you grab the right or left side frames, the double headed arrow points left and right and the window can be sized horizontally. Grabbing the frame at any of the four corners shows a double headed arrow pointing at a 45 degree angle and the window can be sized both vertically and horizontally. Minimizing a window does not terminate or end the application program; it merely “hides” or minimizes it until you need it. It is clearly important to be able to access a window that has been minimized and that you can no longer see, because the Minimize, Maximize and Close buttons are no longer visible, either. The KDE Panel is one way to restore minimized windows. The Task Bar is the component of the KDE Panel which is used to keep track of running programs whether on your desktop or minimized. It is also useful for locating windows which are open, but which are hidden behind other open windows. Figure 8: This portion of the KDE Panel contains the Task Bar. The Task Bar allows you to restore, or "unminimize" a minimized window. Just click on the button for the window you want to restore. Just click on the task button corresponding to the desired window in the Task Bar portion of the KDE Panel to restore the window. You can also right click on any of these Task Bar buttons to access the Window Menu for that window. This is particularly handy if the window is minimized and you cannot access the Window Menu in any other way. Notice that the window with the focus, that is the program which will accept keyboard input is highlighted in bold text in the Task Bar, and minimized windows are grayed out. Window focus is an important concept. Although many people sort of figure this out on their own, there a couple of things that need to be said. The important concept to remember is that the window that has the focus is the window that will accept keyboard input. If you type anything on the keyboard, the window that has the focus will accept that text, but only if the cursor is in a text entry field of some type. If no window has the focus, then the KDE Desktop itself has the focus. You may type something on the keyboard, but unless it is a command that is recognized by KDE, the input will be ignored. The window with the focus can be determined visually by the fact that the title bar is a different color, usually a brighter color, while the title bars for all the other windows are usually gray. Of course your color scheme may vary, but this is the default. The window with focus can also be identified in the Task Bar, as in Figure 8, by the fact that its title is bold.